On 20th April, The Pickle Factory hosts the return of maestro Donato Dozzy, who presents a 4 hour No Boundaries set of music from the outer reaches of his record bag. Donato plays from 10pm-2am, but the evening does not end there. From 2am-8am, we present a No Boundaries after party, with two DJs who perfectly match Donato Dozzy's sound, along with Pickle Factory booker Toby Nicholas, who will carry on the party into the wee hours of Sunday morning. Headlining is a Very Special guest, the shooting star of UK techno, and a perennial Pickle favourite. We cannot reveal his name, but here's a clue: he debuted at Labyrinth festival last year... He's joined by Labyrinth mainstay, No Way Back resident, and one of the great DJs of our time - Patrick Russell, who will take over from Dozzy at 2am. 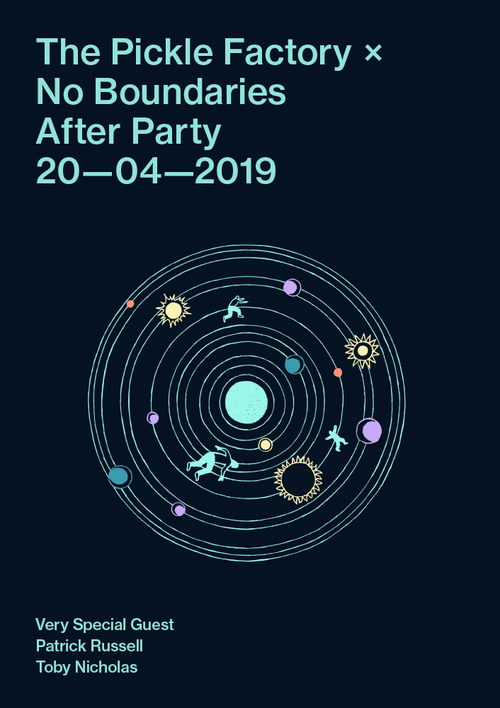 Please note: this After Party is FREE for all ticket buyers to Donato Dozzy's No Boundaries All Nighter at Pickle Factory running 10pm-2am. All you will need to do is remain in the club at 2am, with 6 more hours of music at no extra cost. Otherwise, there are very limited £10 tickets online, which allows entry from 2am onwards. And we will be selling tickets OTD from 2am onwards - but there may be a queue.